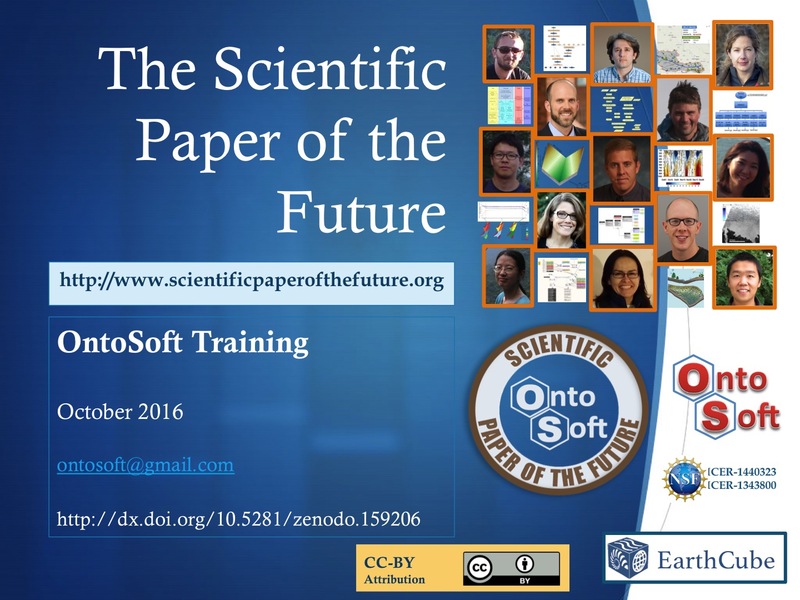 "The Scientific Paper of the Future" training materials for the OntoSoft project are available from http://doi.org/10.5281/zenodo.159206 under a CC-BY license. A powerpoint version of the slides is available upon request. Towards the Geoscience Paper of the Future: Best Practices for Documenting and Sharing Research from Data to Software to Provenance. Yolanda Gil, Cédric H. David, Ibrahim Demir, Bakinam T. Essawy, Robinson W. Fulweiler, Jonathan L. Goodall, Leif Karlstrom, Huikyo Lee, Heath J. Mills, Ji‐Hyun Oh, Suzanne A. Pierce, Allen Pope, Mimi W. Tzeng, Sandra R. Villamizar, and Xuan Yu. DOI: 10.1002/2015EA000136. Section 4 provides an overview of best practices, which are summarized in Table 1 and Figure 2 as an author checklist. List of accepted articles from the Special Issue of the AGU Earth and Space Science journal.